SSC GD Constable Exam consists of 4 mandatory sections viz. General Intelligence & Reasoning, General Awareness & General Knowledge, Elementary Mathematics and English Language or Hindi Language with 25 questions from each of the four sections for maximum marks of 100 with 90 minutes duration. Certain number of vacancies are allotted to Male and Female Candidates. Computer Based Exam removes all aberrations which are produced during Pen Paper Mode of Examination. Solving as much as Mock Tests you can is an effective way to crack a CBT Exam. 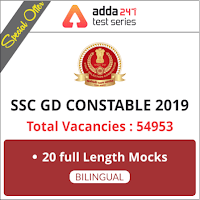 Thus eventuating the requirement of Mock Tests in order to create an exam like environment, bringing celerity in your instant speed and improving time management, ADDA247 will be conducted All India Mock for SSC GD Constable Exam 2018 on 9th & 10th February 2019. Use Coupon Code AIM19 to take this latest pattern based live Mock to analyze your performance and garner knowledgeable exam related material to your memory for further use. Study Material regarding govt exams are a dime a dozen these days but ADDA247 burns the midnight oil to make you challenge yourself while clearing all the decks. In the wake of this, ALL INDIA FREE MOCKS TESTS held on each Sunday on ADDA247 is a revolutionary step to make the best of your skills. Take part in the Free Mock to come to know about SSC GD Constable last year questions level, complexity and tricks hidden in the questions asked. Upon submitting your ALL INDIA FREE MOCK TEST get your All India Rank, detailed solutions of every question. Being facilitated with success tools by ADDA247, utilize all these to shape your future. Make yourself available for this All India Free Mock to ease your chances of cracking the exam as it is every day’s effort that counts and makes your dream come true.